The 6-Week 16MM & HD Filmmaking Camp for Teens provides students with an intensive introduction to the craft of filmmaking and gives them an opportunity to direct a longer final film than is possible in our shorter camps. In the 6-Week 16MM & HD Filmmaking Camp, students are introduced to 16mm film and hi-definition digital video. Each student writes, directs, shoots, and edits four short projects of their own, using 16mm and/or HDSLR cameras, professional lighting packages, and digital editing systems. Hands-on classes in directing, writing, editing, cinematography, and production cover all the creative and technical demands of telling a story with moving images. Each week, all of the students’ films are screened and critiqued in class with the instructor. • First Week: Teens are introduced to 16mm cameras. The first project is shot in film. Students practice shooting on these cameras before their shoot day on a camera test exercise. • Second, Third and Fourth Week: The next three weeks of the 6-Week 16MM & HD Filmmaking Camp are structured around the production of two more short films of increasing complexity. This time, students will work on HDSLR cameras. Each week, students will edit and screen their projects in class, receiving critiques and reviews from their instructors and classmates. • Fifth and Sixth Weeks: Each student devotes the fifth and sixth weeks of the program to directing and editing a longer film of up to 6 minutes in length. There is additional time for preparation and one-on-one consultation during pre-production of their films. Students take advantage of this time to polish their scripts, to scout locations, and to cast. Students in the 6-Week 16MM & HD Filmmaking camp have the opportunity to shoot their final project on film or digital. Students work in three or four-person crews to complete each film. Every student directs four films. When colleagues direct, students rotate among the key crew positions (director of photography, assistant camera, and editor). Students shoot films almost every weekday throughout the workshop. This results in an enormous amount of hands-on experience. Students receive a certificate upon successful completion of the program. The 6-Week 16MM & HD Filmmaking Camp for teens attracts a dynamic, international group of students from all backgrounds. The combination of non-stop collaborative work, the mix of diverse cultures and experiences, and a shared passion for film make the camp an intensely enriching experience. 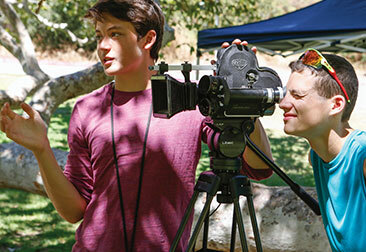 Classes in the 6-Week 16MM & HD Filmmaking Camp are limited in size. Prospective applicants should carefully consider the location descriptions to take full advantage of the diversity of locales. Please see the locations section for a detailed description and dates of each program. 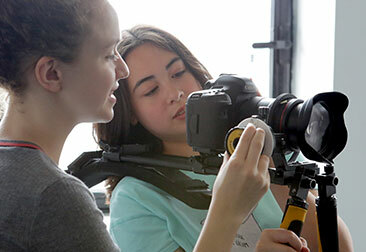 Curious to learn more about the 6-Week 16MM & HD Filmmaking Camp for teens?